Why You Choose ONEVER For Your Car? • High quality sounds input and output with noise-reduction technology, keep your phone call speaking and music playing streamlined and clearly. • It can be playing via Bluetooth, TF card and USB flash drive,multi ways music playing for you choose. • It will not randomly play or chose to play. The music will be not play from the last one when you off car. It will star from first music again. • Switch to Hands-free mode automatically from music playing status when receiving call with great sound quality. • Supports redial last call and voice broadcast. • Simply open the App to get the car parking imformations on cell phone, Save you trouble and time to find your car. - Insert it into the car's cigarette lighter socket. - The LED displays the car voltage for 3 seconds, then enters into Bluetooth pairing mode. - Turn on cell phone Bluetooth, find the device"BT69" and click to connect. - Tune your car radio to local blank FM frequency,then match this device to the same frequency. - Before leaving your car, turn on the "Fast Find Car" App, connect it and save your car's location. 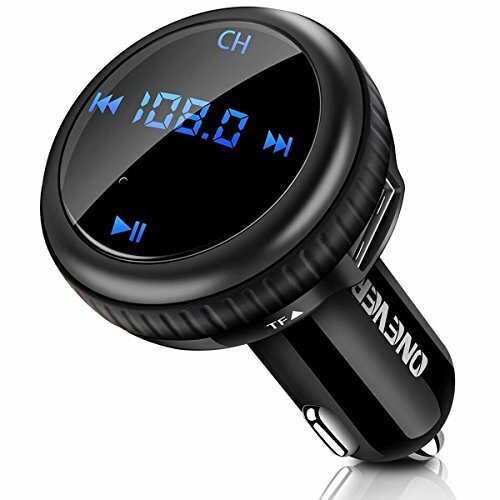 UNIVERSAL COMPATIBILITY - ONEVER Bluetooth FM Transmitter works well with most bluetooth enabled devices, such as iPhone 8, iPhone 8 plus, iPhone X, iphone 7 iphone 7 plus, Samsung, HTC, LG, Blackberry, Sony, Tablet and iPad etc. Support multi music playing modes: Bluetooth, TF card and USB flash drive. SMART CAR LOCATOR - This FM transmitter works on 12V/24V vehicles and "Fast Find Car" App. Every time when parking, this car charger will automatically save the parking position. When you need find the car, simply open the App to get the car parking location, direction, distance and parking time onto your cell phone. App works on iOS and Android devices via Bluetooth. Dual USB CAR CHARGER - Built-in dual USB ports, Max. 5V / 2.1A output, fully recharge your device in SHORT time, handy additional USB port means you can charge another device fast while you are driving, it can ONLY support USB flash drive audio playing. HANDES-FREE CALLING & BATTERY MONITOR - Built-in microphone feature supports hands-free phone calling as well as redial last call and voice broadcast. The current battery voltage level can be detected and displayed on the LCD display while the car starts. WHAT YOU GET: 1*Bluetooth FM Transmitter + 1*User manual + 18 months Worry-Free Warranty + 24-hours email contact service. Please let us know if you have any questions or concerns, we're standing by to assist you all the time. If you have any questions about this product by ONEVER, contact us by completing and submitting the form below. If you are looking for a specif part number, please include it with your message.